Do Cats Chew Their Food? 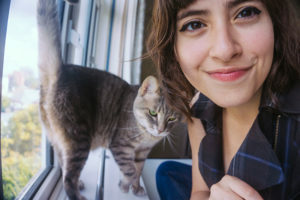 My Cat Doesn't & I'm Concerned: What Can I Do? Do Cats Chew Their Food? 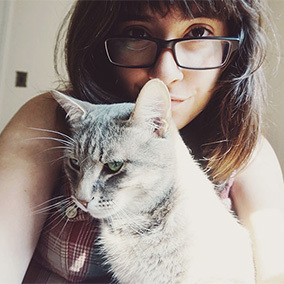 My Cat Doesn’t & I’m Concerned: What Can I Do? When we humans eat meals we (typically) chew quite a reasonable amount with our teeth before we swallow. Among a number of beneficial purposes, the act of chewing helps break larger food into smaller pieces so that, once we finally do swallow, it’s a lot easier for our esophagus to carry our food down to our stomachs, and easier for our stomachs to digest our meals. But what about cats? If you’ve found your way here it’s likely because you noticed your cat doesn’t really chew his or her food. 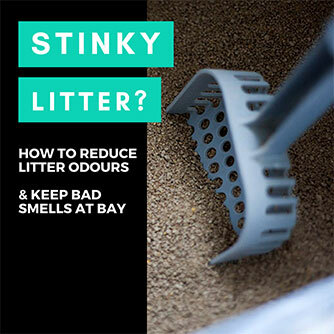 You may be wondering whether this is something your particular cat does, whether it’s potentially problematic, or whether it’s completely normal for the furry felines under our roofs to avoid chewing food entirely. Let’s jump into the facts straight away. Do Cats Chew Their Food? Cats in fact do not really chew their food. Every once in a while, I’ll watch my cat Avery eat his kibble and notice he takes a single bite out of every second or third piece before swallowing. But chewing? Never happens, not in any meaningful sense at least. And this is completely ordinary behaviour for a cat. Cats are obligate carnivores. This doesn’t mean they never eat foods besides meat in the wild (they absolutely do eat plants at times!). Rather, being an obligate carnivore means cats need to eat meat to survive. Cats require high amounts of protein in their diets, and their bodies require both taurine and arginine – two amino acids they can only really get in the wild from eating meat. If a cat tried to sustain him or herself on a plant-only diet in the wild, he or she wouldn’t make it. As a result of their high-meat diet, cats evolved teeth that are perfectly suited for eating meat. Pointy teeth, a lot like our canines. We use our canines for tearing – foods like bread sometimes, but mostly for meats, like beef steaks, pork cutlets, the fleshy bits off chicken bones, that kind of thing. We may chew our meat directly after, but that’s not a job for our canines. We tear meat to a reasonable size with our canines first, then the move the food to the back of our mouths, where our molars, the flatter teeth in the back, take care of the time consuming chewing. Our molars are great for chewing because they have a large, flat surface area to make the job easier. It would be a lot harder to do any half-decent chewing if you were to try doing it all at the front of your mouth where your incisors and your pointy canines live. Since cats have’t got such flat molars like we have, and most of their teeth are pretty pointing, chewing as humans do is not quite viable. Their teeth are much better suited to tearing through food like our canines are, so even biologically speaking, there’s quite a bit of reason for cats not chewing. 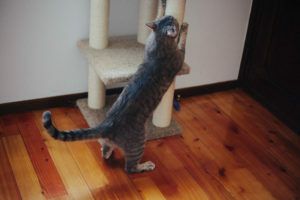 As a heads up – because cats don’t really chew food, they can find it difficult to eat foods that are very big. Think a kibble or treat is a bit big for your particular feline? 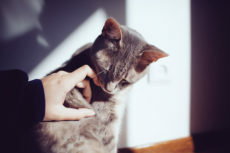 Make sure you watch your cat to make sure there is no struggling, issues with swallowing, or choking that happens when he or she tries to eat the food. If ever there is any struggle, avoid giving your cat that food, or pre-break the treat or kibble before offering it up to your kitty. 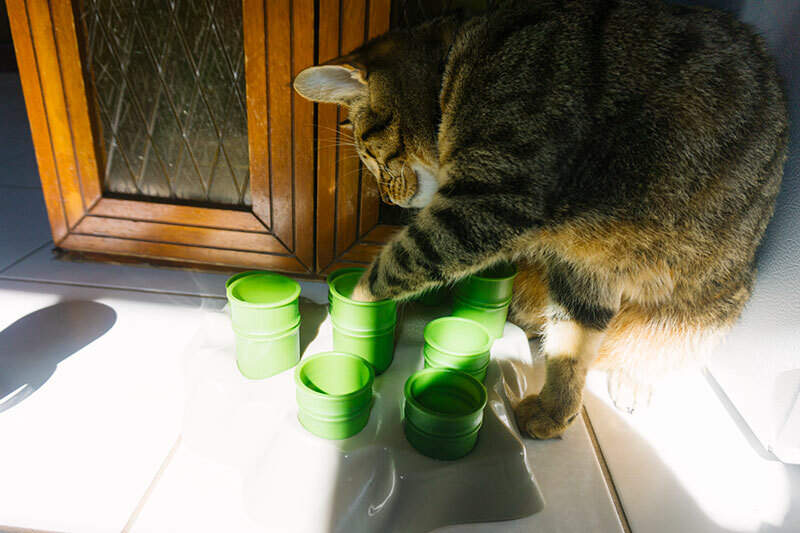 While many cats will break or tear their food adequately into smaller parts before swallowing, there are times when a cat will skip doing this, even when it’s important to do so. So make sure to err on the side of caution and only give your cat food that’s easy for him or her to swallow whole – without needing to tear or break it apart with teeth first. But Cats Break Down Big Pieces of Food Into Smaller Ones: Isn’t That Chewing? Yes, cats absolutely do break down big pieces of food into smaller ones by tearing food with their teeth. They also sometimes take a single bite of a piece of food (like kibble) to crack it and make that one piece into two of a smaller size. But here’s why I’d insist this doesn’t qualify as chewing. 1. Bite and work (food) in the mouth with the teeth, especially to make it easier to swallow. 1.1 Gnaw at (something) persistently. While yes, cats tear food with their teeth, they don’t really work the food, or gnaw at it persistently afterward, to make it considerably easier to swallow. Instead they just break huge chunks they don’t have the ability to swallow easily into smaller chunks that they can swallow easily. Then down the esophagus it goes. If you want to call that chewing – no problem, in that case, cats do chew. But note that their style of chewing is very different from ours. 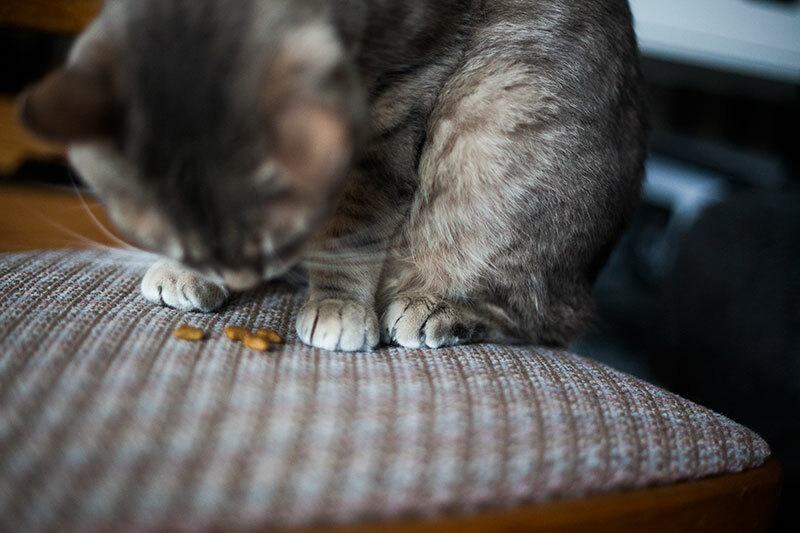 If your cat has issue with plaque, cavities, or more or less any dental issues and you’ve heard that eating dry food could really help him or her out, hit the pause button on switching to dry food for a moment. 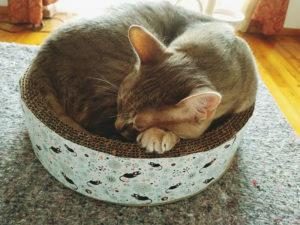 In my article titled, “Is Wet, Dry, or Raw Cat Food Better for a Cat’s Teeth?“, I spoke about the reason why kibble is more or less unlikely to actually help with a cat’s dental problems – cats don’t chew their food! And the premise of many dental treats, the benefits of kibble for better oral hygiene, etc. is that the process of chewing the kibble cleans a cat’s teeth. Well if cat’s don’t chew, they can’t possibly reap this benefit and have cleaner teeth after they eat, can they? When it comes to preventing plaque build up, cavities, and dental issues in general, the important thing is to make sure whatever food you have for kitty is not high in sugar. If you get a wet food or a dry cat food, so long as it’s high quality and has little sugar in it, you’re good to go. If you already have that kind of grub for your kittykins? You’re good to go. But note that cats still have dental problems while eating good food. The reason why? Again, I mentioned this in my article about whether specific types of cat food are better for a cat’s teeth (take a peek here to see the full article), but essentially – even wildcats like lions sometimes have issues with teeth. 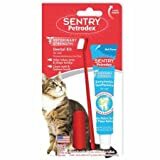 The only way you can make sure your cat will have healthy teeth for life is to regularly brush your cat’s teeth with a cat toothbrush + feline toothpaste, and go into the vet for regular check ups and teeth cleanings (if your cat needs them). Sad to say, but any other methods of preventing dental issues are nowhere near as effective as these two. 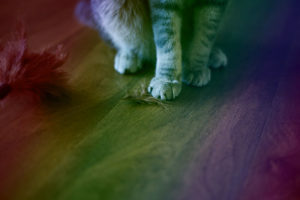 If your cat is eating too quickly, is struggling to maintain a low, healthy weight, or is vomiting every so often – no amount of feline chewing lessons (or even successful kitty chomping) is going to help. 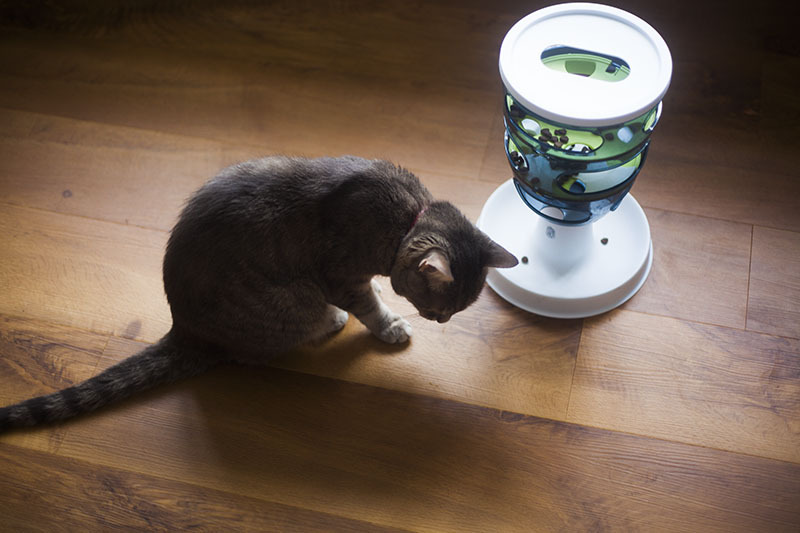 Luckily, there are a lot of incredibly effective methods for slowing down a cat’s eating, the easiest of which is to invest in a slow feed cat bowl, and all revolve around the concept of limiting how much food a cat can get into his or her mouth in one bite. Want to see what they are? 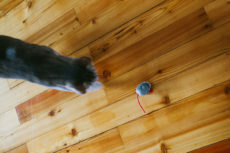 Check out this article on how to get cats to eat more slowly. Obviously, if you can get your cat to slow down eating, your cat is likely to struggle a lot less with weight gain (because he or she will be more likely to feel fuller before the whole meal is scarfed down), as well as vomiting after eating. But please do keep in mind that sometimes weight gain and vomiting are symptoms of other, bigger health issues, so please be sure to check your cat out at your vet just to be certain everything is a-ok health-wise. 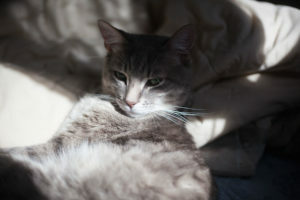 Vet tell you kitty’s fit as a fiddle, you worked to slow down the eating, but the weight/stomach issues still not fixed? The absolute best thing in my mind to prevent weight gain through overfeeding – the trick I outlined here; it works like a charm no matter how many meals and snacks you want to delve out per day. 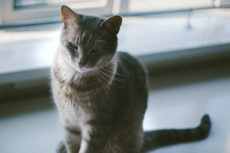 For sensitive stomach issues – try offering your cat 4 meals spaced out throughout the day instead of one or two big meals, to see if it’s not actually eating too fast that’s causing the vomiting. 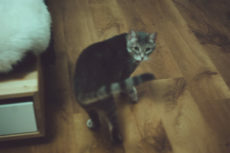 Some cats with sensitive stomachs (like my own Avery used to have) throw up on empty stomachs rather than because they’ve eaten too fast, and spacing out meals in these cases helps since that way your cat’s stomach is never fully empty. 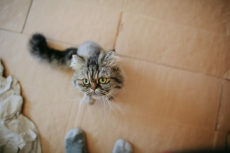 If you have an indoor cat who’s overweight, your feline may also benefit from a switch to a specially formulated indoor cat food (since indoor cats typically don’t exercise as much) or a diet cat food. And if your cat is having issues with vomiting every so often, a sensitive stomach cat food may help out with correcting stomach acidity problems. Absolutely ask your vet before switching cat foods and if he or she has any recommendations – but note that you do have options. Do you think the way cats bite and tear qualifies as chewing? If not, did you realize that cats don’t actually chew their food? If you do think that qualifies as chewing, were you surprised to learn that cats don’t chew the same way we do? Do you have any cat chewing stories or related thoughts to share? Would love to hear what you have to say on the topic down below in the comments! Bored Cat Ruffling Feathers? Ruffle Back with These Feather Cat Toys!